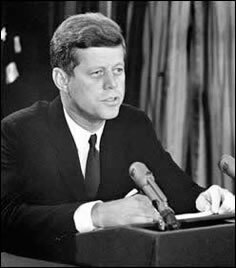 On November 22, 1963 an assassin ended the life of John F. Kennedy, 35th President of the United States of America. The events of the hours after the tragedy were spontaneous and reverent: adults cried in the streets of our cities; governments and businesses shut down; people sat stunned in front of their TV sets or radios watching or listening to unending hours of programming dedicated to reporting the details of the assassination. The Sunday following the assassination, his flag-draped coffin was moved to the Capitol for public viewing. Throughout the day and night, hundreds of thousands lined up to view the guarded casket. The events of the days that followed are unprecedented in history: Lee Harvey Oswald was apprehended only to be shot by Jack Ruby - in full view of a shocked TV audience. Though there is no connection between these events and the demise of the Studebaker automotive division, the end of Avanti production was announced by Studebaker only a few weeks after the assasination. 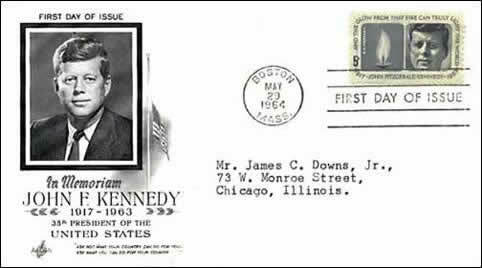 The Kennedy memorial stamp - shown below on a first day of issue - was created by Avanti designer, Raymond Loewy. Kennedy at a press conference. First day of issue JFK Memorial stamp designed by Raymond Loewy.